Reading a soil science textbook is not the same as reading a book from the New York Times best sellers list. There’s no “Fifty Shades of Soil” to read that’s for sure! An introductory course in soil science is taken at one point in the college career of every turf, hort, and ag student. At most universities, the textbook used is The Nature and Properties of Soils (published by Pearson/Prentice Hall), and authored by Dr. Nyle C. Brady. Today there are many soils textbooks, covering an introduction to advanced to more specialized soils topics. Dr. Brady’s book, however, remains the standard and provides the foundation for all others. Each chapter warrants a full semester of study, with topics such as soil water – characteristics and behavior, soil chemical properties, soil physical properties, soil biology, soil organic matter, soils and plant nutrition, and much more. This book should be on your shelf as a ‘go-to’ reference on soils when needed. There are even references to turfgrass management found in the book. Dr. Cale Bigelow’s turfgrass research published in 2004 can be found in The Nature and Properties of Soils 14th ed. ; Figure 12.15 in Chapter 12 – Soil Organic Matter. 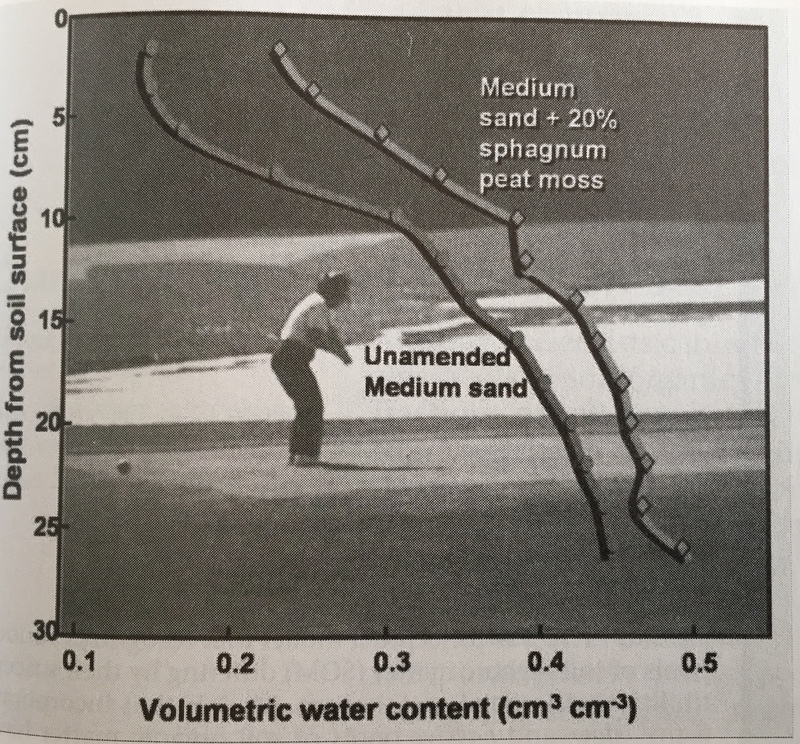 Graph illustrates improved water retention when peat moss added to sand. Nyle Brady and Ray Weil co-authored the 14th edition of The Nature and Properties of Soils, published in 2007. Future editions will only feature Dr. Ray Weil, University of Maryland, as the principal author. Dr. Nyle Brady died on November 24, 2015, at the age of 95. Originally from Colorado, he earned a BS in Biochemistry from Brigham Young University, and a Ph.D. in agronomy from North Carolina State University (back when it was NC State College). His career included professor at Cornell University, Associate Dean at Cornell’s College of Agriculture, Director of the International Rice Research Institute in the Philippines, Director of Scientific Education for the USDA (Washington, DC), and served as Chairman of the Agricultural Board for the National Academy of Sciences. On a personal note, he leaves behind 22 grandchildren and 90 great-grandchildren! Thank you Dr. Brady for your insight into soil science.